Unlike Ferguson, North Charleston or Baltimore, no one was killed or injured here. This is an affluent, mostly white area without a history of serious racial tension. But the expressions of anger and the demands for change on Monday night in McKinney, Texas, recalled scenes from elsewhere in the US: hundreds of demonstrators protested then marched to the spot where three days earlier a police officer shoved a teenage girl in a bathing suit to the ground, swore and pointed a gun at two unarmed boys. The officer’s response to a minor fracas at a pool party was so intense that a bystander’s video of Eric Casebolt’s actions turned the weekend event into the latest episode of the broiling controversy over police aggression in their encounters with black people. 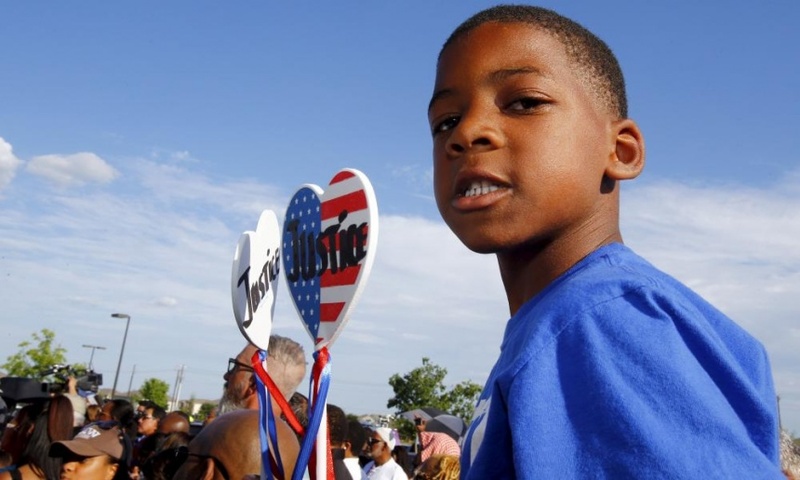 The footage posted online had only attracted significant media attention the day before, but the community moved so quickly that about 500 people attended the rally, which began at an elementary school in the city on the northern edge of Dallas. The chants demanding reform and accountability and the “Black Lives Matter” T-shirts and placards underlined the reality that this event was an heir to the outrage that had boiled up in other cities – the latest waypoint for a movement. Casebolt, who had been with the police department in McKinney for a decade, was placed on administrative leave on Sunday for his role in the incident. “It may not be Baltimore but folks are going to come out and protest when it’s blatantly wrong,” said Hillis Davis, a 52-year-old from the nearby city of Frisco. Elbert Denkins, a 44-year-old who works for the US navy, said he came “to support my neighbourhood and everybody who’s involved with it because it’s happening everywhere, it needs to stop”. He said the wave of protests against the police was empowering. “I think they’re getting some confidence to come out here and not be afraid any more. At one point in time nobody really wanted to say anything. They were like: ‘You know what, they’re going to take care of it’,” he said. Read More Texas pool party incident raises questions about wealth and race | US news | The Guardian. This entry was posted in News from the Soul Brother and tagged affluence, Baltimore, Black Lives Matter, Craig Ranch North Community Pool, discrimination, Ferguson, gentrification, McKinney, North Charleston, Policing, race, racism, social action. Bookmark the permalink. 1- From the first paragraph it is stated that no one was killed or injured here. This is an affluent, mostly white area without a history of serious racial tension. My question is: Could it be that the financial “affluent” mostly white area without a history of serious racial tension could in fact be the reason that the racial misnomers haven’t come up? 2- Please explain to me how the young lady dressed in a bikini at a “pool party” has anything to do with being shoved. A- The young girl who was shoved to the ground was screaming “I want my Mama’s gun…I want my Mama’s gun” and even a cursory look at the video you mention shows first: the police officer being hit with towels and fists about his body by a gaggle of girls who returned to the scene, the two boys you mention also attacked the officer whilst he was on his knees therefore, witnesses to that aspect of the video said he was correct for pulling his weapon. 3- It is somewhat disengaging to me that you stand by the “…it’s the white cops or police brutally” when all things being equal, all information is being used by both parties.